Associate economics professor Matthew Winden introduces materials to students on the first day of fall classes on Tuesday, September 4, 2018 in Hyland Hall on the UW-Whitewater campus. BISMARCK, N.D. — Matthew Pittman, of Powell, has been named to the president’s honor roll with a 4.00 GPA for the fall 2018 semester at Bismarck State College. “Honor is defined as ‘high respect; great esteem.’ Thus, it’s entirely appropriate that we have a President’s Honor Roll that lists those students who’ve brought high respect and great esteem to themselves through diligence, hard work, and exceptionalism in their academic studies. We recognize them all with great honor,” says BSC President Dr. Larry C. Skogen. GREENVILLE, SC (01/07/2019)— Grant McLravy, a Freshman Accounting major from Westerville, was among approximately 900 students named to the Dean’s List for high academic achievement during the Fall 2018 semester. BJU offers over 100 undergraduate and graduate programs in religion, education, fine arts and communication, arts and science, health sciences, and business. BJU has nearly 3,000 students from nearly every state and more than 40 countries. We are committed to the truth of Scripture and to pursuing excellence in all we do. CLEMSON, SC (01/09/2019)— Chad Simms of Westerville graduated Dec. 20, 2018, from Clemson University with a Master of Science in Civil Engineering. Simms was among more than 1,600 fall semester graduates from Clemson. GOSHEN, Ind. — Goshen College recently recognized 211 undergraduate students for excellence in academics on the fall 2018 dean’s list. Andrew Nussbaum, a senior TESOL major from Galena, was recognized for academic excellence on the fall semester Dean’s List at Goshen College. Nussbaum is a Big Walnut High School graduate. The dean’s list includes students earning at least a 3.75 GPA, while completing at least 12 hours of coursework for a letter grade. Only grades from the designated semester are included in the dean’s list selection process. GROVE CITY, PA (01/08/2019)— Wei-En Lu is one of 39 seniors to earn their degree from Grove City College on December 18, 2018. Lu earned a Bachelor of Science degree in Mathematics and is from Westerville. GROVE CITY, PA (01/09/2019)— The following students were names to the Dean’s list for the Fall 2018 semester at Grove City College. Wei-En Lu, a senior Mathematics major at Grove City College, has been named to the Dean’s List with High Distinction for the Fall 2018 semester. Wei-En is a 2015 graduate of Homeschool and is the son of Dr. and Mrs. Chao-Wen Lu (Ching-Shiang) from Westerville, OH. Trent Strick, a senior Mechanical Engineering major at Grove City College, has been named to the Dean’s List with Distinction for the Fall 2018 semester. Trent is a 2015 graduate of Worthington Christian High School and is the son of Mr. and Mrs. Paul Strick Jr. (Carol) from Westerville, OH. Grove City College (www.gcc.edu) is a highly ranked, national Christian liberal arts and sciences college that equips students to pursue their unique callings through an academically excellent and Christ-centered learning and living experience distinguished by a commitment to affordability and promotion of the Christian worldview, the foundations of a free society and the love of neighbor. Established in 1876, the College is a pioneer in independent private education and accepts no federal funds. It offers students degrees in more than 60 majors on a picturesque 180-acre campus north of Pittsburgh, Pa. Accredited by the Middle States Commission on Higher Education, Grove City College is routinely ranked as one of the country’s top colleges by U.S. News & World Report, The Princeton Review and others based on academic quality and superior outcomes. PAINESVILLE, OH (01/07/2019)— We’re honoring more than 240 Lake Erie College Students who were named to the Fall 2018 Dean’s List, including: Michael Bayda of Westerville; Erron James of Westerville. Also making the list from Delaware County were Cynthia Saxby and Madelyn Smith, both of Delaware. COLUMBUS, Ohio – The Ohio State University Police Division (OSUPD) has new leadership. Kimberly Spears-McNatt officially took over as the division’s first female chief on Jan. 1, 2019. Spears-McNatt is joined by recently appointed Deputy Chief Tracy Hahn. Spears-McNatt becomes the agency’s 11th police chief. Her full-time appointment comes six months after taking over as interim chief, following the departure of Craig Stone. Spears-McNatt has served the university community as a police officer for nearly 25 years and was named deputy chief in August 2016. She is a member of the National Organization of Black Law Enforcement Executives, the Ohio Association of Chiefs of Police and the International Association of Campus Law Enforcement Administrators. During her time with OSUPD, she’s received several honors, including a Commendation Award and a Medal of Valor. Spears-McNatt received her bachelor’s degree in criminal justice from Ohio State and went on to earn a master’s degree from Franklin University. Deputy Chief Hahn also graduated from Ohio State and served OSUPD for three years, beginning in 1990. She spent the remainder of her law enforcement career in the Upper Arlington Police Division (UAPD). She became the first female police chief at UAPD, retiring in that role on Sept. 22 before rejoining OSUPD in late-October. Hahn received her bachelor’s degree in criminology from Ohio State and went on to earn a master’s degree from Tiffin University. The Ohio State University has realigned existing units to establish a new, comprehensive office designed to provide students with the tools and opportunities they need to thrive and succeed academically from the first point of contact with the university through graduation. Under the new structure, the units dedicated to enrollment services and undergraduate education were merged to form the Office of Student Academic Success (OSAS). The new office is led by Beth Hume, vice provost of student academic success and dean of undergraduate education, who has overseen the consolidation since the Office of Academic Affairs announced the merger in June. “Under Beth Hume’s direction, this new unit will further our progress in improving affordability, raising retention and graduation rates, and enhancing the academic success of all students,” said Executive Vice President and Provost Bruce A. McPheron, who asked Hume to manage the merger. OSAS is the result of months of strategic planning and engagement with colleges, the offices of Student Life and Diversity and Inclusion, and other university stakeholders to create a collaborative and intentional system to strengthen the recruiting and academic success of a highly qualified, diverse student body, Hume said. OSAS leaders anticipate collaborating with partners across the university to remove obstacles to student academic success and support students throughout their academic journey. “Just because we are called the Office of Student Academic Success doesn’t mean we assume we are the only ones responsible for it. Student success falls to all of us at the university, and depends on collaborations among us all to achieve the mission,” Hume told University Senate in late November. Under this new structure, OSAS aims to: increase the representation and academic success of underserved populations; improve overall retention and graduation rates, including those of campus-change and transfer students; enrich the academic experience of all undergraduate students; increase affordability and reduce debt upon graduation; deliver consistent, reliable resources and high-quality tools that support the academic success of undergraduate, graduate and professional students. Hume is a longtime Ohio State linguistics faculty member who chaired the Department of Linguistics from 2006-2011. She spent six years as a dean, professor and school director at the University of Canterbury in Christchurch, New Zealand, before returning to Ohio State in October 2017 to lead undergraduate education. The merger has led to the consolidation of 21 offices into 10 units: Strategic Enrollment Planning; Undergraduate Admissions; Graduate and Professional Admissions and Imaging; Analysis and Reporting; Student Financial Aid; Buckeye Link; Transition and Academic Growth; Academic Advising; First Year Experience (FYE); University Exploration; Academic Enrichment; Honors & Scholars; Service Learning; Undergraduate Research and Creative Inquiry; Second-year Transformational Experience Program (jointly administered by OSAS and the Office of Student Life); Research and Program Assessment; Undergraduate Education; Military and Veterans Services, ROTC; Student Athletic Support Services Office (SASSO); University Registrar; OSAS Administrative Services; OSAS Marketing and Strategic Communications. For more information about OSAS, visit osas.osu.edu. ANGOLA, IN (01/04/2019)— Kayla Dennewitz of Westerville, a student on Trine University’s main campus, earned Dean’s List recognition for the Fall 2018 term. Dennewitz is majoring in Exercise Science. To earn Dean’s List honors, main campus students must complete a minimum of 15 hours and have a grade point average of 3.500-3.749. Join the conversation, #TrineU. Trine University, an internationally recognized, private, co-educational, residential institution, offers associate’s, bachelor’s, master’s and doctoral degrees in the Allen School of Engineering & Technology, Ketner School of Business, College of Graduate and Professional Studies, Franks School of Education, Jannen School of Arts & Sciences and Rinker-Ross School of Health Sciences. Trine is a member of the Michigan Intercollegiate Athletic Association and offers 23 varsity sports. Its golf program includes the university-owned 18-hole championship Zollner Golf Course. Founded in 1884 and accredited by the Higher Learning Commission of the North Central Association of Colleges and Schools (www.ncahigherlearningcommission.org), Trine operates a 450-acre main campus in Angola, Indiana, and education resource centers throughout Indiana and Michigan. WHITEWATER, WI (01/07/2019)— Brian Zimdars from Galena, Ohio, has made the University of Wisconsin-Whitewater Dean’s List for the 2018 fall semester. These students have demonstrated their academic abilities by receiving a grade point average of 3.4 or above in a single semester. The Registrar’s Office reports 3,460 students were selected for the Dean’s List for the fall semester. About 13,000 students are currently enrolled at the university’s Whitewater and Rock County campuses. 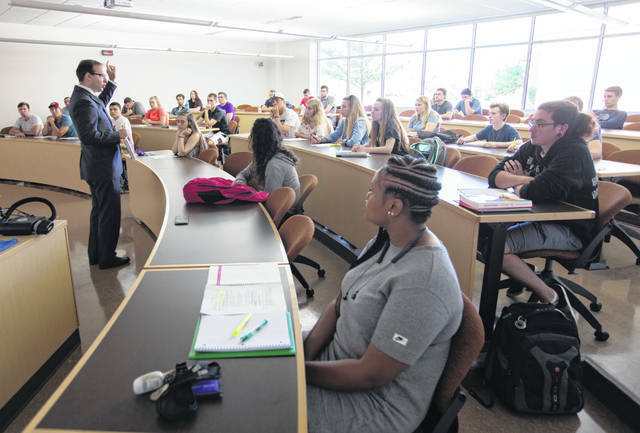 https://www.sunburynews.com/wp-content/uploads/sites/48/2019/01/web1_UWW_business_winden_classroom_0249.jpgAssociate economics professor Matthew Winden introduces materials to students on the first day of fall classes on Tuesday, September 4, 2018 in Hyland Hall on the UW-Whitewater campus.